Owning an Android Smartphone is just not enough, as Android serves a great place for customization. So installing great custom launchers for Android can prove to be a fun way to play around with this platform. 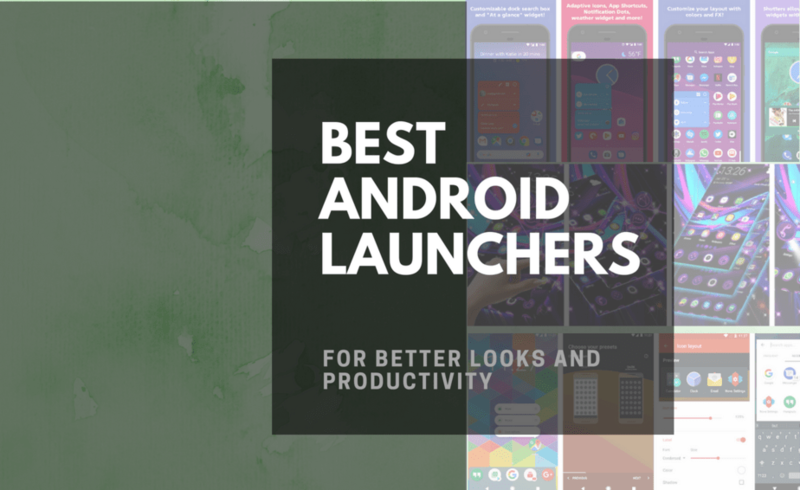 Below is the list of best Android Launchers to revamp your smartphone. All these launchers we choose according to usability, features and the level of customization that you can do. The TeslaCoil Software; that’s considered as the pioneer in designing full-fledged home-screen custom launcher, developed the Nova Launcher. The free version of this launcher lacks few of the advanced customization features like the notification badge, but for the average users that’s more than enough. The amazing fact is that there are loads of nova icon packs and launcher themes available in the play store. One just got to find out what’s best for them. Nova stands out of the crowd due to its both minimalistic and customizable UI (user Interface), themes animation, icons package, and much more. Moreover it has room for handling any widgets, along with full-sized clock widgets for android or other kind of weather widget apps. If the tricks and tips can be unfolded by someone then they can have the most out of the Nova launcher. Evie launcher is developed for performance and is one of the fastest growing Android launcher. This launcher is functional, beautiful yet very simple. It revamps the entire outlook of the android phone with its new icons, new app drawer, new themes, new notification style, and much more. The app drawer can both work as a list or grid style, and a custom dock is also there for adding shortcuts of significant apps. The Universal Search feature of it lets the user search within apps from a single place. There are several icon packs that can be downloaded from Play store. Apex Launcher drives away the Android system customization into a whole new level, and is said to be the rival of Nova. It has features exactly like that of Nova, but has a bit of modifications. Apex Launcher is available in two formats, both paid and Free. For regular users free version works fine, and the power users can go for the Pro version that’s paid. One can have the Android Nougat experience when aligning it with any Google Pixel Launcher or icon pack applications. It has two types of scrolling format; elastic and infinite scrolling. Apex launcher has professional vibe in everything. One can customize icons, folders, transition effects, and much more. Microsoft launcher comes from the team of Microsoft developed for Android. It doesn’t exactly give the look of Windows 10; it’s just designed to give the Android users a touch of love for Microsoft. The company has unfolded their own launcher for the platform. Microsoft Launcher easily adds with many of the Android services of Microsoft. For users those use their Office suite of apps for the Skype video calling service, it is just perfect for them. Buzz launcher simply reaches the paradigm of customization in Android. Its exclusive feature called the “Homepack Buzz” is a service of home screen customization with over 700,000 home screens uploaded and been shared by thousands of users. It has got a default app-locker and a RAM cleaner, means no need to install any additional cleaner or app lock apps. Many gestures are available with which one can access many shortcuts with just single swipe by their finger on its home screen. There’s also an additional feature available within the app, called the “Screen effects”, where there are live wallpapers effect. But instead of replacing the wallpaper, it simply overlays the wallpaper with animated effects like; “autumn leaves” or “snow-fall” playing around on the screen. There are so many variations in customizations that one can never get tired of it. This launcher is especially designed for giving the Android platform an entire new stylish look. This is a small and super-tiny launcher file means it will consume less space. For faster scrolling there’s A-Z scroll bar and has “Android N” style animation covering some of the main features of this launcher. Other than that the launcher also has some features with modish look. It has a helpful sidebar with handy functions on it like; memory cleaner, recent apps, torch, shortcuts of favourite apps, etc. Moreover, one can download new themes, icon packs, and wallpapers for customizing the launcher. New Launcher not only delivers a great look, but also has some phone boosting, power saving tools to let the user have the best experience while using it on their Android phone. For those who love adventures and want to spice up their phone with some amazing themes then Apex Launcher is just the one. It is an adventurous launcher sported with loads of features to play around. Although, this launcher is highly customizable, yet there quite a few unique features that will prove to be the centre of attraction of this launcher. The intuitive yet a sleek user interface making it adequate to productivity, though, one can customize it as per their will. The only thing the launcher needs is a good rendering Smartphone having an ample RAM and good processor for it work nicely. Apart from this, the quick bar and the quick drawer is something exclusive in this launcher. With its “Quick theme” one can instantly change themes. It sports the quickest scrollable docks over any other launchers. These Android launchers will simply spice up the Android Smartphone, giving it a whole new look and fun user experience. They will surely bid goodbye to the monotonic feel of default Android launcher. Install them today and dig into the cool of handling an Android Smartphone with some cool features and look. They are faster and they are free. Do let us know which of these best Android launchers you have downloaded for customizing your Android.